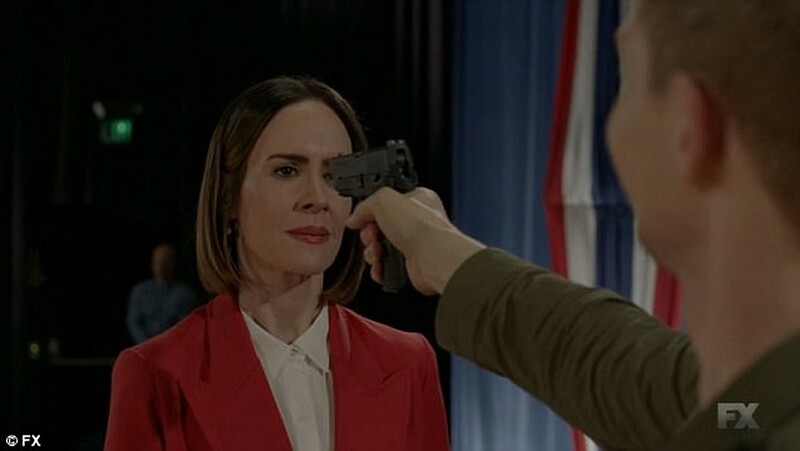 “I’m sorry, are… are you saying you believe me?” Ally (Sarah Paulson) asks breathlessly in a midseason episode of American Horror Story: Cult. She’s just told Sally Keffler (Mare Cunningham), a middle-aged Berkeley grad and the only local citizen willing to run against Kai Anderson (Evan Peters) in the upcoming city council election, that Kai is heading a murderous cult and that her life could be in danger. When Sally tells her she does believe her, Ally’s response is one of near-reverence. “Thank you,” she whispers, head bowed. It’s what she’s wanted for the whole season, and perhaps for her whole life: to be believed. Like most characters in the American Horror Story universe, Sally meets an unfortunate end (at the hands of the cult, no less) soon afterward. And Ally, like many in her situation – mentally ill, queer, female, and traumatised – goes back to not being believed. For something filmed months prior, this finale is very now, given the implosion of just about every industry with emerging harassment and abuse allegations. Plagued by phobias and wrestling with various diagnoses, Ally is a prime target for disbelief from others, who treat her with kid gloves but often underestimate her strength and credibility. Her therapist (Cheyenne Jackson) doesn’t believe her. Her wife, Ivy (Alison Pill), doesn’t believe her – or pretends she doesn’t so she can gaslight her, take your pick – and certainly doesn’t take her fears seriously. Ally’s mental illness and gender, and perhaps her queerness as well, work against her to lessen her credibility as a narrator. She is targeted by Kai’s cult for long-term gaslighting precisely because of her vulnerability: as Kai says, “no one will believe a crazy woman”. Ivy, for her part, understands this vulnerability and harnesses it to her advantage for purposes of revenge. The gaslighting, in turn, exacerbates Ally’s phobias. AHS has always had a fraught relationship with mental illness, and with disability in general. The franchise has employed disabled actors (particularly in 45s circus-themed season Freak Show) and brought significant attention to underexplored topics. However, the full-throttle breakneck speed at which the series runs often leaves its exploration of thorny issues like trauma and its relationship to mental illness (the eternal chicken-or-egg question) half-baked. Is this intersectional feminist empowerment, or just the new regime, with Ally and others with her privileges at the top of the hierarchy? When Ally’s mental illness no longer serves the plot, it disappears, as if by magic (a common theme in the Ryan Murphy canon). “You cured me, Kai,” Ally tells him upon her return from the psych ward, after a presumed lifetime of psychological distress. Though by season’s end, we can't be sure if she was merely manipulating Kai to hide her undercover collaboration with the FBI, this abrupt pivot problematically posits that the way out of mental illness and towards empowerment is through reactionary rage. After all, it’s precisely the slippage between preexisting mental illness, trauma, and its consequences that allow Ally to conceal her cooperation with law enforcement, as well as her murder of Ivy: No one believed her capable of such a thing. The season's ending, in which Ally dons a telltale green SCUM hood and, it’s implied, heads her own iteration of Valerie Solanas’ radical man-murderess group, will be read by many as a feminist move, a kind of cathartic victory after she’s been overlooked due to her gender and mental health issues for so long. The reality is a bit trickier. Kai, the violent, woman-hating ‘Divine Ruler’, may have merely been replaced at the top by a rich privileged white woman. Ally’s privilege allows her to ‘pass’ as both radical and tame without facing any consequences, just as Kai went under the radar building a white male army. It now looks like Ally, in her new state senator position, is taking over for Valerie Solanas, played earlier in the season by Lena Dunham: the woman who wrote the SCUM manifesto, tried to kill Warhol and who is frequently criticised as the patron saint of self-absorbed white feminism. Cult’s ending may in some ways be seen as a surface-level feminist triumph, or the passing of the mantle from one privileged person to another one. Ally has followed in Kai’s footsteps, ascending to the senate seat as he planned to do. Against this ideological backdrop, Ally’s victory feels somewhat hollow. What’s more, Ally couldn’t have succeeded with the women of colour around her. Former reporter Beverly Hope (Adina Porter) is arrested (though later released), while Ally isn’t, and though she’s painted by the media as victim rather than perpetrator, it’s Ally who is the hero. Let’s not forget that it was Beverly who actually put a bullet through Kai’s brain. Ally wins the senate seat, and Beverly, along with prison guard Gloria (Liz Jenkins), who’s secretly been colluding with Ally while carrying on an affair with Kai, has had to do her dirty work. Is this intersectional feminist empowerment, or just the new regime with Ally at the top? Nevertheless, Ally promises her son, Oz (Cooper Dodson), that the terror is truly over. This time, she says, things will be different. It’s not an entirely convincing promise, but we still get the sense that her survival represents a kind of progress.